"Free and easy Christmas ornament"
Homemade Christmas Crafts are a wonderful way to get into the Christmas spirit. But you don't have to wait till Christmas; you can start now so you will have the project completed and ready for use. These crafts are made with love and make excellent gifts for friends and family. As they open their gifts this year they will appreciate the little bit of you that you've put into these homemade Christmas crafts. Christmas embroidery designs will add a beautiful touch to these unique ornaments. There's a trend going round of exchanging Christmas ornaments for gifts. It's an inexpensive way to let those on your Christmas list know that they are thought of without breaking the budget. Well, how about taking that one step further and spinning those ornaments from homemade Christmas crafts. 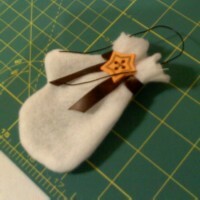 They can still be easy on the budget and everyone will appreciate the time and love that is sewn with each stitch. 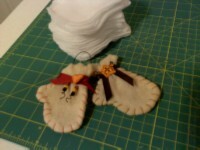 One easy ornament that you can make are mittens. Once you have them all cut and sewn the possibilities are as limitless as your creativity. 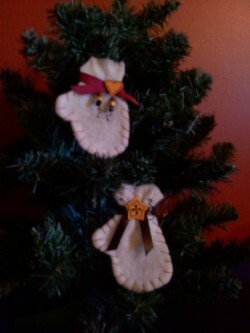 The ones I've shown here are decorated in a primitive theme but you can do anything with them to suit your own tastes. For example, you can add lace and old buttons for a Victorian look. Personalizing the mittens by embroidering Christmas embroidery designs would make a very unique gift. Adding names and dates to mark special occasions is a great way to save a memory. Any theme will work; do you have an outdoor enthusiast? I found some great fishing basket buttons at a local craft store that could be added to the mittens. Use a leather cord around the wrist instead of ribbon and bend some craft wire into the shape of fishing hooks and there you go! While you're out and about rummaging through yard sales, thrift stores, craft stores check out the little trinkets that line their tables. You never know what you might find that you could use in making your homemade Christmas crafts. 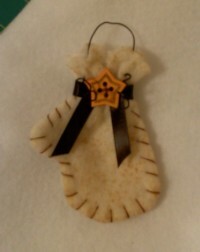 Making these ornaments is quick and easy. Adding the detail afterward is of course dependent on the theme you choose. First you need a pattern. You can either trace an infant sized mitten or you can sketch one onto paper or card stock. The ideal fabric for the mittens is a double layer of 100% cotton batting. But I've discovered that in a pinch you can get away with using polyester too. Fold your fabric in quarters to cut out more than one set at a time. 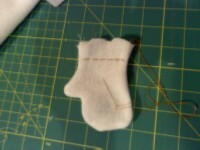 Sew about a ¼ inch hem all the way around the mitten except for the normal opening at the wrist. 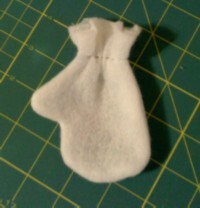 Clip the corner between the thumb and the mitten so it will lay flat and then turn inside out. 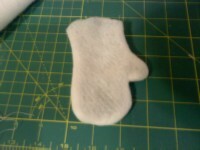 If you want you can use pinking shears to trim the top edge of the mitten to give it a nice look. Here you will want to hand stitch across the wrist to gather it. Once its gathered you can go ahead and decorate it. If you want an aged look you can spray with a coffee solution and let dry, or if you'd like a snow effect use glitter glue. Have a dancer in your family? Decorate with sequins, the possibilities are endless! 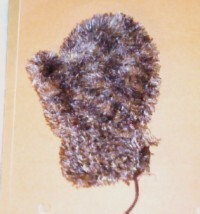 For the hook cut the desired length of wire and poke the ends through the opening of the mitten. 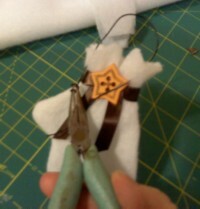 Use some needle nose pliers to curl the wire for visual effect. Stitch the opening of the mitten closed and add stitching around the edges for that primitive feel. You can make sets of 3, 6 or even 12 of these quickly and give them away for gifts. Lay them flat in a tissue lined Christmas box for a wonderful presentation. So, what are you waiting for? Go ahead, get started on those homemade Christmas crafts.